Ludum Dare #34 Compo from the 11th to 14th December, 2015! the Ludum Dare compo #34 was on during the 12th to 14th December, 2915 and I participated in the 48 hour part of the jam (compo). As Marmalade Technologies were kind enough to provide me with a free Indie license during the last Mini Ludum Dare #63 event and for the next seven months, it was a great opportunity to explore this API even more. It enables both 2D and 3D games and is easy to deploy for the Windows desktop, so it definately fit for the compo, however due to technical and temporal constraints, I chose a 2D path as you see here. I streamed myparticipation at our Twitch page as always and I was glad to see a few people pop in and chat during this time, so thank you all for your time! 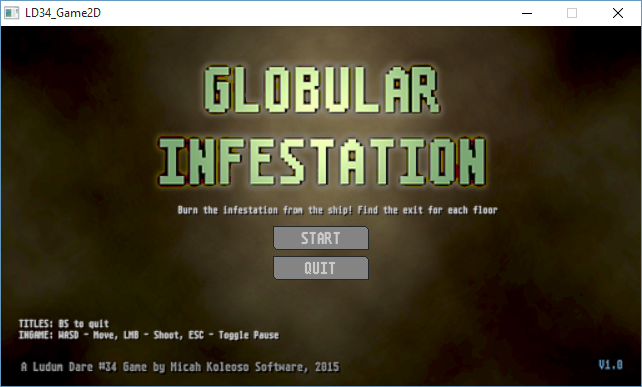 The game page for ‘Globular Infestation’ is now up here, along with a description of my intensions as well as download links for the free initial game (demo) and all resources. As the game was not finished during the compo, you are getting a technological demonstration which gives a basic flow of the game with only two levels and no enemy attacks. However, I will be continuing work on the game to complete the features I had in mind during the compo but did not get to finish, so that we can all get a rounded game out of this. I’m estimating about 6 months to complete the initial Windows (x86) version, but I would like to port a version to Android with a slightly changed control scheme. Posted in Uncategorized	| Comments Off on Ludum Dare #34 Compo from the 11th to 14th December, 2015! We’ve submitted a version of the game ‘Orcland Rivals’ at the Mini Ludum Dare #63 webpage here where you can download a build of the game as well as the source for all code, graphics and all other assets. Our game page with all the details about the game and the event is up permanently here now. Posted in Uncategorized	| Comments Off on We stand with Paris! GameKid Raspberry Jam Entry 09.2015 page available now! as a result of the GameKid Raspberry Jam which ran at Itch.io from the 13th to 20th September 2015, we have setup a page for our entry “Van Sang’s Pain” here. The game was developed on a Windows PC using Python & Pygame. GrafX2, Graphics Gale and Photoshop was used to create the 2D Art, as well as Visual Studio Code for the source code editing. All art assets were created specifically for and during this jam event. Sounds and music were either downloaded from SoundBible.com or re-used from our earlier game ‘Tank Crush – Eviction’. 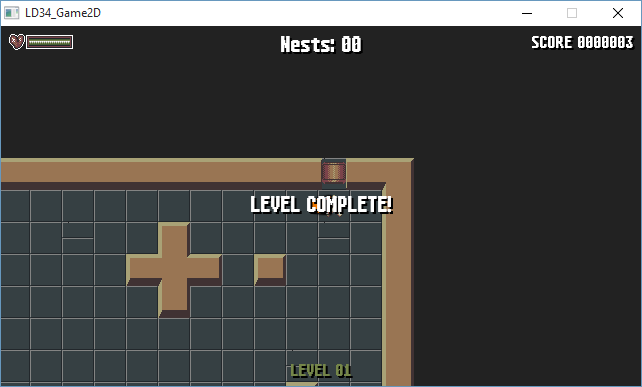 Level creation was performed in Tiled. Filezilla (SFTP) was used to transfer the files to the RetroPie installation on the Raspberry Pi 2. The game is available free and comes with links to setup instructions. Please note! This is the RetroPie download version, see below for the Windows version of the game. *** UPDATE: 04.10.2015 – Updated game to v1.2. *** Fixed the sound effect playing lag. *** UPDATE: 11.10.2015 – Windows-x64 version now available for download here. Unzip and use run.bat to start the game. Posted in Uncategorized	| Comments Off on GameKid Raspberry Jam Entry 09.2015 page available now! we’re gearing up for the next Ludum Dare coming up in about a week from today. Regardless of the chosen theme, it will surely be a fine experience and a good opportunity to explore some facets of game development. Check out our stream at Hairein’s Twitch Stream during that weekend to see what we get up to. We will start streaming a little earlier on Friday to show our preparations and then go from Friday until Sunday night UTC+2. Afterwards, there will be a game page here at this site with all downloads available. It will be great to follow the other developers too, it’s always a pleasure to see what everyone comes up with. *** UPDATE *** – You can check out everything in a few minutes on the LD #33 page link shown above in the header. The Windows, Mac OSX and Linux downloads will be provided along with the entire project, source code and assets. I’m currently participating in the 48-Hour Ludum Dare 32 game creation competition with the above named subject as the target. Due to the short time and it being only 1 person working on the game, I will postpone making a game page and posting screenshots until after the event, but I plan to host the result here tomorrow evening. It is being developed using Unity 5’s WebGL as the engine while assets are being created in Modo INDIE and Photoshop. *** UPDATE *** – You can check out everything on the LD #32 page link shown above in the header. I’ve just submitted everything as required and plan to take the evening off to get some rest and see the other LD entries coming in. we’ve moved development of the game ‘Galactic Repairs Inc.’ from Unity 4.6x to Unity 5. We are currently producing placeholder assets and implementing the basic code logic for missions as well as the main interface. Our plan is to take advantage of the new PBR capabilities Unity 5 brings but we need to get a playable demo (preAlpha) out as soon as possible. After that, we will be putting up a page at IndieDB with more videos and images. One of the biggest changes here has been the decision to implement the game as single player only in the first version. This helps cut out the backend server complexity and enables us to concentrate on the user experience and development speed should pick up due to this. We are Charlie! Wir sind Charlie! Je Suis Charlie! …I’m missing words to describe my feelings about this world. 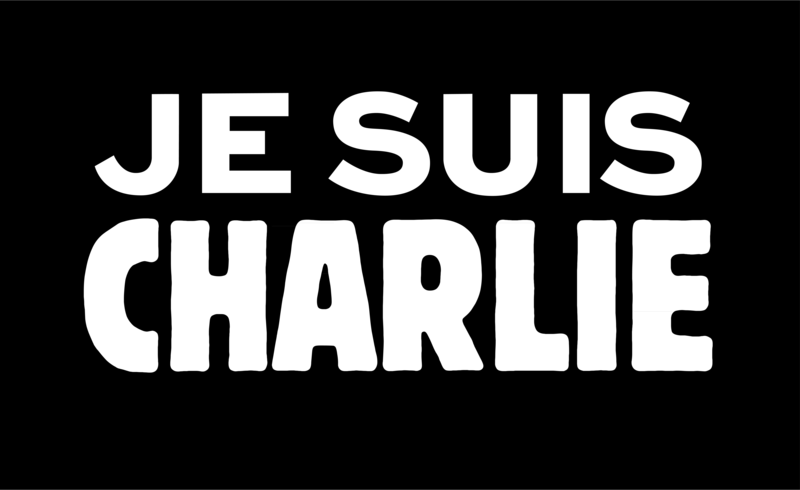 Posted in Uncategorized	| Comments Off on We are Charlie! Wir sind Charlie! Je Suis Charlie! We wish you a peaceful and happy time with lots of days off to be creative, eat too much good food and get lots of sleep each day! Starting into 2015, we are still holding back further production on the Wii U Version of ‘Tank Crush – Eviction’ because it would need more polish and an art update, so we are still undecided whether to can the 2011 game or not. Apart from that, we will be releasing a tool for the iPad next year and will then start work on a new, smaller game. Posted in Uncategorized	| Comments Off on Merry Christmas 2014!